Ajax Load More CSS is loaded automatically (unless disabled) from the /ajax-load-more/core/css/ folder within your WordPress plugin directory – as of version 2.10.1, users can load Ajax Load More CSS stylesheets from their current theme directory. Create an /alm directory in the root of your current theme folder. Copy and paste the contents of ajax-load-more.css and save the file as ajax-load-more.css in the newly created /alm directory. 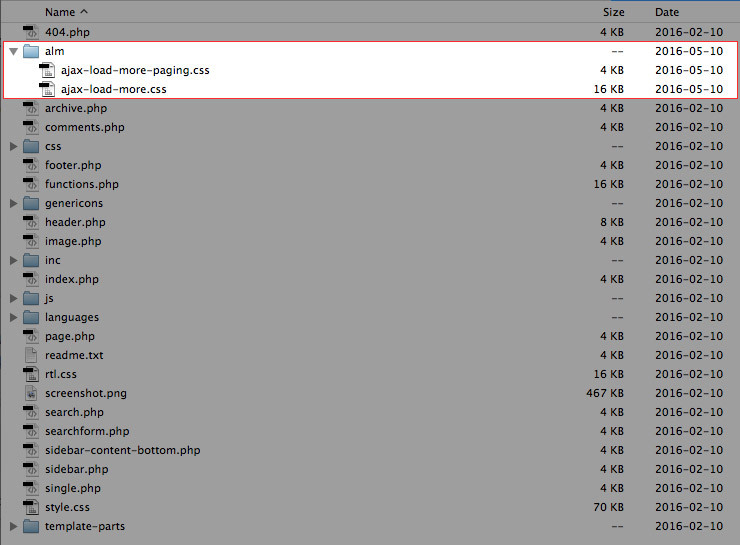 Update the new ajax-load-more.css file however you wish. It will not be overwritten when the plugin is updated. On page load, if Ajax Load More is able to locate a custom version of ajax-load-more.css it will be loaded in place of the version stored in the plugin directory. Paging add-on users can load a custom version of ajax-load-more-paging.css using the same method outlined above.